Today’s question comes to us from Jeff via e-mail and he asks about the philosophy behind the Yoga teachings. Still being very new to it all, I wonder if you may be able to help by advising some decent books I may read to help deepen my knowledge further. Canada’s jewel in the lotus and amazing yoga philosopher is Michael Stone, he has several books. My favourite is still his first, The Inner Tradition of Yoga. Sally Kempton’s book Meditation for the Love of it – says it is about Meditation, but honestly the philosophy is all about yoga. 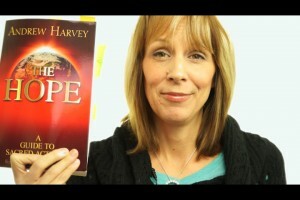 and Andrew Harvey’s book The Hope is amazing. Dr. David Frawley is an amazing Yoga Scholar.